Full-Service Florist For All Occasions! City-wide delivery available! These comments will go directly to Flower Shop Network. This is NOT a method of direct communication with THE FLOWER COMPANY for the purposes of ordering or rectifying problems. Easy to order online and was delivered in a timely. wonderful and fast service, very recommendable. Thank you Fernando, we appreciate you sharing with us. So glad we could accommodate your flower order. Have a great weekend! I was very impressed by the visual presentation and arrangement of the bouquet. It is gorgeous! Judy N.
Judith, Thank you for taking the time to share with us, we appreciate it! We work hard to make it look as close to the pictures as possible. Since flowers are a living thing, it can be challenging at times. So happy to hear you liked the flowers. Ordered a bouquet & chocolates for a family member. She said that the bouquet was exquisite & choc selection excellent. Very pleased with the service & products! Thank you for taking the time to send us a review. We are so glad that your loved one enjoyed everything, that makes our day! First class service from The Flower Company, as I've come to expect. Adrianna always contacts me if there's a problem and everything always goes smoothly. I couldn't ask for more. Thank you Chris for taking the time to share with others about the service you receive. We really do strive to make sure everyone's gift is taken care of. Have a great New Year! 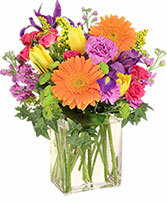 As always, The Flower Company is reliable, friendly, and always presents beautiful arrangements. It’s the only flower shop I go with in Albuquerque. Thank you Janae, we appreciate you sharing kind words with us. We love our job and people like you make it so much more enjoyable! The flowers were beautiful. Prompt delivery. Thanks! So good to hear you're still enjoying your flowers. Thank you for letting us know. 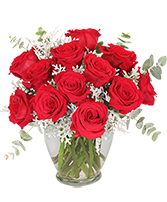 Ordered flowers for my wife. Last second she decides to leave the house for the as afternoon. I called the shop and they were able to have them delivered in 1/2 hour. Now that's customer service!!!!! Could not have been a smoother transaction and experience. Beautiful arrangement delivered within hours of order being placed. Very happy with the service, the flowers (a dozen roses), and the cost. Thanks, it made being apart on our anniversary a little better. Thank you for taking the time to leave us a great review, we appreciate it, especially as a local shop. So glad we could help make your anniversary a little better. Thanks you made it very easy to take care of my mom! Thank you Victor, it was our pleasure to get a floral gift to your Mom. Thank you, so glad to hear everything was great. We appreciate the time you took to share with us! My mom loved her flowers! I requested a substitute and the flowers used were perfect. Thank you thank you!! Thank you for taking the time to let us know, we are very glad to hear that your Mom loved her flowers! I ordered a flower delivery for my mother's birthday, given that we live in different states. I learned that she was headed out of town for a long weekend on the day the flowers were to be delivered. The Flower Company also learned this while at her door. They kindly & so generously made her a new arrangement to be delivered when she returned home several days later. I was so surprised & grateful. I will forever take my business here & cant recommend it enough. Thank you to everyone at The Flower Company. The staff at the Flower Company were wonderful! They went above and beyond to get my basket delivered. I had the wrong address and they contacted me and Redelivered without charging me extra and made sure to get it to my friends before they left town. Thank you Giovanna for sharing your experience with us! We are glad we could help get your gift out to your loved ones. The flowers were perfect in freshness, arangement, everything. Others even remark how beautiful they are, and still are after many days. Thank you so much for taking the time to let us know how much you have enjoyed the flowers! It's always good to hear that they held up well. Adriana and Jan are so polite and helpful!!! It was an awesome experience I will go back there forever! It was easy to place the order and the feed back from the recipient was....the arrangement was Beautiful! Thank you. Thank you so very much for taking the time to contact us about not having a phone number and then being so nice to have the driver wait until I could google and get the number. Thanks to your driver and the lady that called me about the order. My customer is a elderly lady and she was very pleased when I just called her to let her know her order had been delivered. My Thanks to your entire staff and driver. New shop is absolutely gorgeous. Love the location at Scottsdale Village! It is obvious that your training is far above the norm for Albuquerque. Have you taken special classes? The flowers sent to our friends' funeral were so tastely done. Thank you. Thank you so much! There was a lot of hard work that went into the new shop and it means a lot when it is noticed! So glad to hear that the flower tribute was appreciated as well. The shopping was easy, the flowers were quality but the shipping was expensive. Thank you for your review, we do appreciate it and are glad that you were happy with your floral gift. Just as a note, anytime something is shipped out of town the delivery will be higher than if it were an in town order. Thank you again and have a Happy New Year! Arrangement was beautiful. What are the "berries" called? You guys are amazing!!! She loved them!! wonderful determined delivery man. Left the gift with our trusty neighbor who brought them over as soon as we returned home from a trip to the cable car mountain. Easy online ordering, flowers arrived timely and were lovely. The web site was easy to use. I did not see the flowers but my friend said they were beautiful. My mom loved the flowers, and you were able to deliver them on time even though I put the order in late. Many thanks! I have never ordered anything from The Flower Company that wasn't just perfect!! Flowers were beautiful and still look good 5 days after valentines day. The arrangement was beautiful, and exactly as ordered. The service and the product were exactly as expected. Encellent. A+++++ my mom loved them! Recipients loved the flowers! They even sent me a picture. 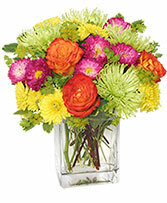 I find ordering online allows me to see and buy a variety of flowers. I like the variety of bouquet grades. You have always delivered on a timely bases a great product!! The dozen roses I received were gorgeous! My mother was very pleased with her delivered flowers. The best and freshest she had ever received from a delivery floral service. Thank you for making her day special. This place is AMAZING! I am a bit of a procrastinator and waited until the last minute to send flowers and ordered them the night before I needed them (after business hours). They not only delivered them without an extra delivery fee but they were beautiful! I will definitely be using the flower company again! Great options, affordable and good communication with customer! My mom says that the flowers lasted a long time which was great! You were able to accommodate the orer even though it was a bit last minute - thanks. 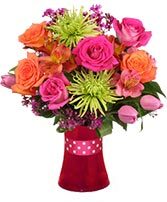 Having just moved to Albuquerque, I was very surprised to receive such a beautiful arrangement--not sure how my daughter found you, but am sure she will use you again. 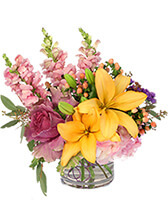 I am always pleased with The Flower Company and use them for any flower arrangements I need. Their arrangements are beautiful, great quality, and their service is impeccable. Always helpful, friendly, respectful. Such nice people to deal with. Beautiful 'fresh' flowers too. As always, the flowers were fresh, beautifully arranged and long lasting - and the delivery was timely and oh so polite. Thank you, Flower Company!!! A-1 product and service, as always! Flowers last and last and last and last. I would NEVER do business anywhere else in Albuquerque! Have been ordering flowers here on a regular basis for two years now. The flowers are always beautiful and last an inordinate about of time, and the service is quick and always friendly. I highly recommend The Flower Company!!! When the arrangement selected was not available,you called and offered an alternative. The recipient was very impressed with the new arrangement. I live in Iowa and have ordered flowers and plants for my aunt in Albuquerque on numerous occasions. They always arrive on time, in excellent condition, and they last a LONG time. DEFINITELY a 5 star experience!!! I was surprised to get an email from you stating that you upgraded my order because you didn't have what I ordered in stock. My friend was very pleased with the basket you sent. In face, she was delighted. Love my flowers. So fresh. Always last quite a while. Thanks! My flowers are beautiful. I always enjoy receiving flowers from your shop. Thanks! My flowers are always beautiful and last longer than any other flowers I have ever received from other companies. The staff are always friendly and helpful. Keep up the great service. My flowers arrived on time and in beautiful condition. They are absolutely lovely. I have no complaints, only the highest praise! Thanks! My 16 yoa grandson just got home from having major back surgery and is a chocolate lover. This basket really made him a happy guy...it "sweetened" his day. This is a video tutorial of why clean water is important to the longevity of your flowers.